National Agency for Food and Drug Administration and Control (NAFDAC) says there is no cause for alarm, as there is no plastic fish in circulation in Nigeria. Warnings about the spread of a so-called plastic fish has have gone viral on the web in recent time. This was after a A UK-based Nigerian man released a video of the fish he bought from a supermarket in London, UK for £10. He revealed that the fish was made from a styrofoam or a plastic polystyrene material soaked with fish oil to have the original fish smell. 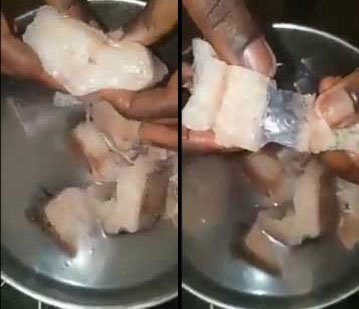 The video sent shivers down our spines and just when Nigerians began to shake it off, news broke that plastic fish had found its way into Abuja. But the National Agency for Food and Drug Administration and Control (NAFDAC) says there is no cause for alarm, as there is no plastic fish in circulation in Nigeria. NAFDAC Management said in a statement in Abuja on Thursday that its finding followed “a thorough investigation and analysis of some unsuspected plastic fish samples” in its laboratory. The agency said that “the investigation was triggered by a report from a consumer in Abuja who claimed that he bought a fish which refused to cook when set on fire for several minutes. “The suspected sample of the fish, after thorough investigation, was confirmed to contain protein and fat which is normal to fish.